Enjoy a foot spa, nail care by a Registered Nurse and a relaxing foot massage in a warm and welcoming environment! Afternoon tea provided. 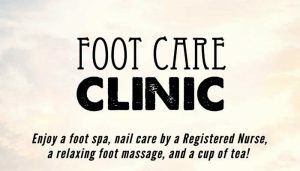 Clinics are held on a Tuesday afternoon every 3 weeks. Appointments essential. (Unfortunately we cannot take those with insulin-dependent diabetes). Phone Sharyn on 022 621 8269 or SCT office 03 981 5521, leave your name and phone number and we will return your call with an appointment time. Provide food for afternoon tea. Serve tea, coffee and food. Fill and empty foot spas. Help massage feet – training provided.